Ezra introduces another round in what’s become a great discussion, at least to those of us ensconced in the juiciest of issues in contemporary economics–growth, full employment, inequality. He’s got all the links you need in there…and yes, as regards the politics of fighting either inequality or slow growth, I’m a bit reminded of the classic Tom Lerher line about the war against Franco: “though he may have won all the battles, we had all the good songs.” Still, there’s an important point about this part of the discussion to which I’ll return at the end. I just wanted to highlight two points made by Larry Mishel in an earlier post on this stuff. First, while today’s debate asks whether inequality hurts growth, the oldsters among us remember the time when the received wisdom was pretty much the opposite: you can have strong aggregate growth or you can have equity, but you can’t have both. The idea was motivated by a lot of OECD research on “flexible labor markets” (I recall thinking this paper provided a very good look at the issue). Back in the 1980s and early 90s, OECD (and other) economists argued that the Europe generally had less inequality than we did because their labor (and product) markets were more rigid—much more collective bargaining, higher minimum wages, stricter rules about hiring and firing. But they paid for that with lower growth rates. A rigorous look at those claims found them to be unconvincing—the “flexibility” turned out to be less about growth and more about distribution. Unions, for example, have been found to have little impact on growth but considerable impact on who benefits from said growth. Thus the debate was all about whether one could push back on some of the forces driving inequality without hurting growth. Of course, that debate lives on—think of the claims of minimum wage opponents: raise the wage are you’ll hurt low-wage workers. Or tax debates: the tricklers argue that raising marginal rates on the wealthy won’t help with inequality because it will kill growth. But I think we’ve made progress. The fact that folks are asking good questions about the potential negative impact of inequality on growth seems to me a strong step away from the wrong direction of the old debate. 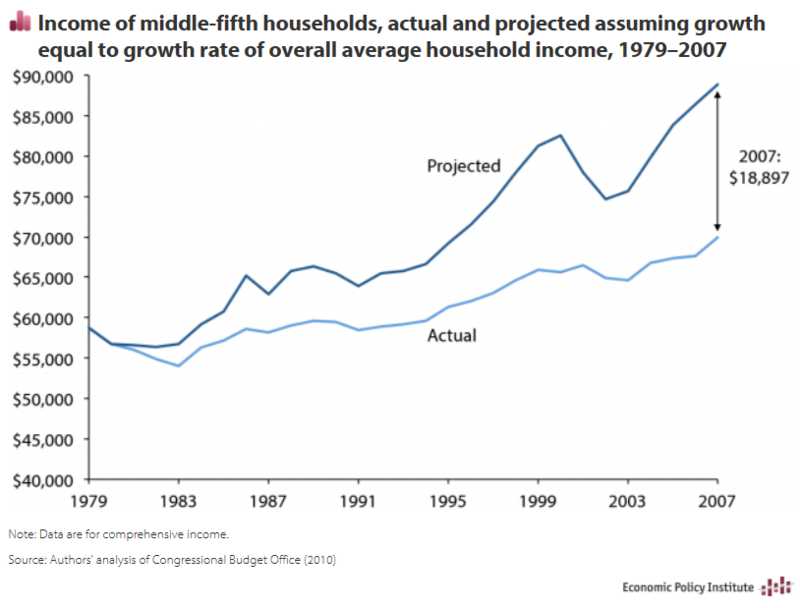 [Bivens] used the CBO’s comprehensive income data to calculate the middle fifth’s income was lower in 2007 by roughly $19,000 compared to a scenario where there had been equitable growth from 1979 to 2007. Josh refers to this as the inequality tax. Finally, on the question of what’s the point of talking about any of this given the cramped politics of the moment…well, clearly progressives need to do more to create the oxygen for policies of the type I introduce here. I’ve been thinking incessantly on that point and will trot out some thoughts soon. But especially after reading Ezra’s post, I’m charged up by the idea of a bottom-up full employment movement, i.e., a large bunch of people insisting that this be a goal that policy makers must pursue in the near term. Especially with hair-on-fire deficit reduction going out of vogue, doesn’t DC need a new mantra? Share the post "How the Inequality/Growth Debate Has Evolved Over Time"
10 comments in reply to "How the Inequality/Growth Debate Has Evolved Over Time"
Let’s not forget George Lakoff’s advice about the importance of “framing” the issue. The precise verbal formulation we use to present the “defining challenge of our time” will immediately trigger in the minds of our audience certain emotions and assumptions about what our policy agenda is and will also trigger certain counterarguments. Whether any of those assumptions and counterarguments are correct or not is beside the point–they will just happen, according to Lakoff. Let me explore four different frames. If the defining issue of our time is inequality, Americans will not resonate emotionally because they generally don’t believe in total equality–they believe in fairness, which is not at all the same thing. People are likely to assume that the proponents’ agenda is massive redistribution of market incomes through federal taxation and more people preferring to live on the dole instead of working. Some will assume the proponents’ agenda is to eliminate all inequality in incomes and perhaps confiscation of wealth accumulations by the state. Others (like me) may assume the proponents have no agenda at all but are merely trolling for middle- and working-class votes. The defenders of the status quo will continue to claim that the proponents’ agenda is unAmerican and even socialist or communist, that it denies personal responsibility, that it destroys incentives to work, invest, improve productivity, and grow the economy, and that all the “makers” will leave the “takers” to wallow in a cold and dark dystopia. If the issue is secular stagnation, people are likely to tune out of what is obviously a technocratic debate they assume they have no capacity to understand and may not affect them anyway. To the extent they follow the talk for a while, they may assume the proponents’ agenda is government spending on infrastructure and R&D, eliminating the trade deficit, and maybe helicopter money. The counterarguments are equally wonky and unappealing: Stimulus doesn’t work, it’ll cause runaway inflation, government intervention always does more harm than good. If the issue is wage stagnation for the masses, as suggested by Lawrence Mishel, people are likely to assume the proponents have no serious policy agenda because they won’t see any obvious way everybody can get more market income. Just raise everybody’s wages 5% every year? Really? People will think the proponents are fools. The obvious counterarguments are that a massive inflationary spiral, like the early 1980s or the Wimar Republic, would be triggered, leaving everybody worse off and the nation on its knees. If the issue is full employment, most people are likely to think that would be a pretty good thing. If they think a little deeper, they may suspect the proponents intend to introduce trade protectionism, limit immigration, create make-work programs (perhaps with government as the employer of last resort), and institute job sharing. The real objection of the status quo defenders is that full employment will lead to rising wages and shrinking profit margins, but that would be a very unpopular thing to say. They may argue that consumer prices will go up as labor costs rise and imports are displaced, even to the point that inflation is unleashed. They may argue that rising labor costs will make it more difficult for US companies to export. Among these options–there may be others–making the defining challenge of our time full employment seems to me to have the best chance of success. Thnx! Interesting and pretty persuasive. So a Ford Pinto with a killer ad campaign is better than a Honda Accord with a crappy one, which means we should focus on selling as many Pinto’s as we should, just because people buying automobiles in general is a good idea? If we don’t get the the answer right, if we (as educated consumers/economists/proponents) simply sell what we think the public will buy, it can only backfire. The only reason anyone would buy what we would be selling is if they trust us that we are right. It doesn’t matter if they believe full employment is the solution. All we have to do is remind them that a 100% full employment picture that has 80% people working at McDonalds, Wendy’s or other low-wage jobs, 19% of people working in middle class jobs and 1% of people working in extremely wealthy jobs (or having a wealthy income, through inheritence or some other method) doesn’t solve the greater macroeconomic problem, of which jobs is only a symptom. If a family of four is sleeping in their car, despite mom and dad working at walmart full time, have we addressed the fundamental problem they are really clamoring for? It doesn’t matter if they think jobs are the answer. Jobs are the answer but ONLY if they produce enough relative income so that the person doing the work can afford the other necessities that go along with sustaining oneself in order to do the job in the first place. Legacy job creation programs like the WPAA and the CCC wouldn’t have worked if the people had only been paid $.03 an hour. Adding more fast food restaurants or more Walmarts just to provide jobs isn’t going to address the fundamental inequality that lies at the basis of our current economic decision making. I’m with Michael C, its important to get the answer right! I’d just add that its also important to “convince” our self appointed allocators of the “intellectual space” that “equal protection under the law” and preventing “tyranny of the majority” are entitled to some of this space; at least our Constitution says that they are, as if that made any difference these days. I second Roger’s comments regarding framing, though I come at it from the marketing perspective of ‘positioning’ (http://en.wikipedia.org/wiki/Positioning_%28marketing%29). Because the sheeple (err, voters) are easily swayed by emotional arguments and, in general, won’t take a minute to research any topic (beyond, possibly, getting their bias confirmed), framing or positioning becomes critical. A poorly positioned product relies entirely on the consumer doing all the work to make a decision to buy, a well positioned product does all the work for the customer except put pen to paper (or reach for credit card, etc.) We see lots of investment in positioning during the election cycle (the next Presidential election cycle is due to start in about a month, another two years of deafening babble! ), but it seems none once the victor has assumed the throne. As much as it sticks in my craw to champion politicians getting even more help from Madison Avenue, I think that there is a strong need for professional marketers to be involved in policy positioning. When, as has happened many times in the last few decades, the positioning of a product is done poorly then the ‘argument’ (in kinder times it would be ‘debate’) becomes all about irrelevancies. Take for instance ‘stimulus’ dollars: if the positioning had started out as ‘lets take this unprecedented opportunity to utilize our rock-bottom interest rates to rebuild our decayed infrastructure over the next decade’ instead of what got repositioned into ‘take from the rich and give to the poor’, I expect a totally different result. The first shows that it would be a short-term event that has to happen immediately as the opportunity likely will expire shortly, the second immediately raises the hackles of even the poor who maintain fantasies of ever becoming rich. The former is temporary, the latter is permanent. The former falls on everyone uniformly, the latter specifically targets the rich. The difference? Perception, like everything else that drives our world. Heck, with government guarantees rather than straight-on debt, we probably could have levered that money and got several trillion invested in a very short time. Imagine if the ‘stimulus’ had been 3-5 trillion in stead of the measly few hundred billion, much of to too big to fail banks. We would be having very different conversations now, I can assure you! Nope, we’re not on board, nor do we support Clinton. We support Warren or Green. Equality – Fairness – bannana. Call it what you want. To do something about it is what it is all about. Start with the easy one. Raise the minimum wage – with a COLA. The increased FICA taxes will help add to the better benefits of Social Security and Medicare. That’s a start. That should be easy. 80% of the public already wants it. Its a done deal, passed, ratified, incorporated into the Constitution. All that’s lacking is enforcement, that’s dependent on elected officials following through on the oaths they take to enforce the provisions of the Constitution. Here’s a link to a page showing the provisions of the 1914 Clayton Act including § 6 which specifically incorporates a denial of “equal protection of the laws” to everyone who’s product just happens to “labor,” you know, the 95%. Without enforcement, the Constitution is nothing more than “words on paper.” Could it really be as easy as just enforcing the Constitution? Maybe that’s even why it was written up and ratified. Income Inequality grows when top income tax rates are below 70%. See the twenties and the 80’s, 90’s and 00’s. Growth slows down as Top Income Tax Rates come down. From 1950 to 2007 real GDP growth slowed down every time the top tax rate was lowered. Listed from highest average top tax rate to lowest top tax rate. The best way to reduce income inequality and increase growth is to raise the top income tax rate back to 70% or above.